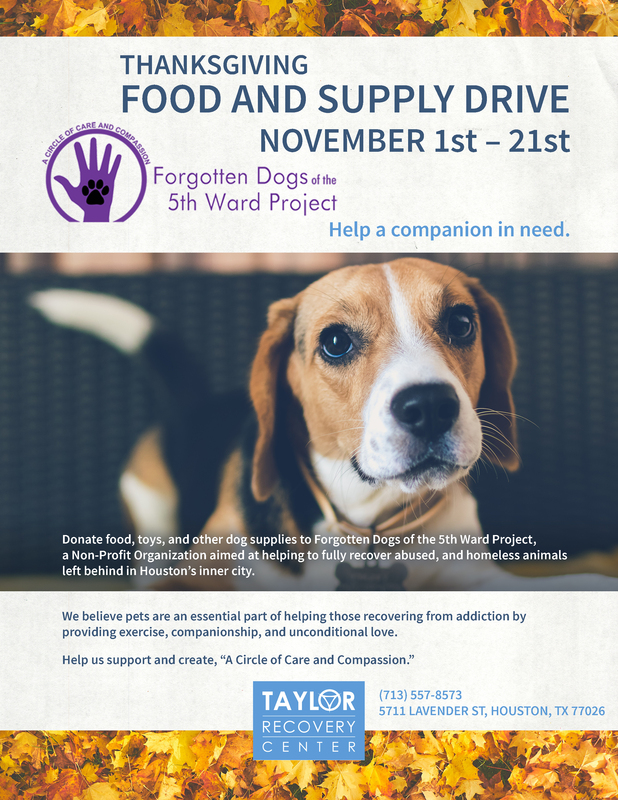 HOUSTON, November 12, 2018	(Newswire.com) - Taylor Recovery Center, a Houston based sober living and addiction treatment center has teamed up Forgotten Dogs of the 5th Ward Project to help dogs in need. From November 1 through the 21, Taylor Recovery will be accepting donations at their sober living location. “Last year Taylor Recovery collected well over 100 pounds of dog food along with a truck full of other necessary supplies such as flea/tick control, beds, toys, collars, and leashes,” said Kristi Taylor, co-owner of Taylor Recovery. Forgotten Dogs of The 5th project has helped to save of 1,000 dogs who had been abandoned by their owners. “The work they do at Forgotten Dogs is incredible. As one of the only sober living centers in Houston that allow dogs, our residents and staff have a special place in their hearts for them. We decided to team up with Forgotten dogs to help our sober living and addiction recovery patients form a loving bond with a dog. A dog doesn’t care about your past, they live in the now, which is what we want our residents to do as well. This event allows us to give back to a non-profit that has given us and our residence, so much joy over the years,” said co-founder Tom Taylor. You can drop off your donations to this great cause at Taylor Recovery Center, located at 5711 Lavender St. Houston, TX 770267.